With people always press for time nowadays, a one-stop venue where you can pretty much accomplish a lot of things is highly appreciated. Lucky for those people who are around Banawe area, there is this new lifestyle complex called Dapitan 55. 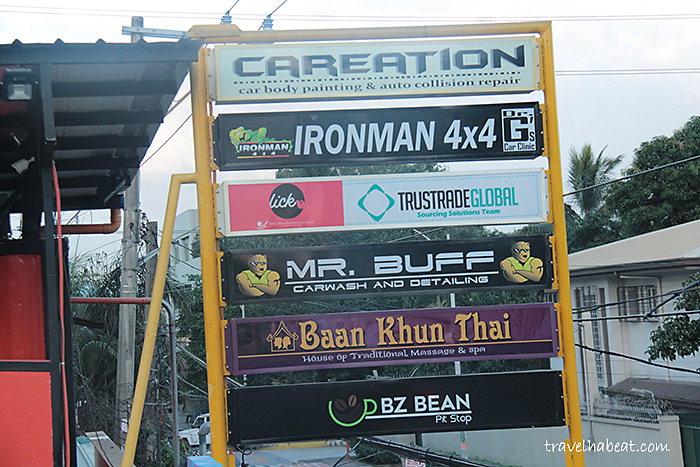 Dapitan 55 lifestyle complex houses Garage Café, Baan Kun Thai, BZ Bean Pitstop and a car wash station. 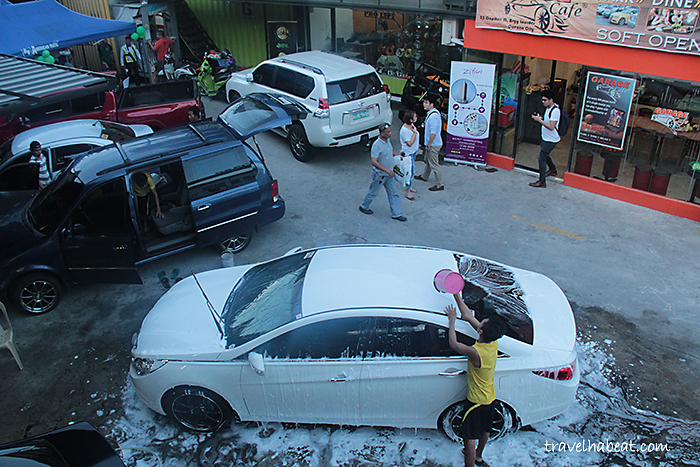 When I first saw the complex from afar, the busy car wash scene caught my attention. As I enter the complex, I immediately noticed Garage Café. 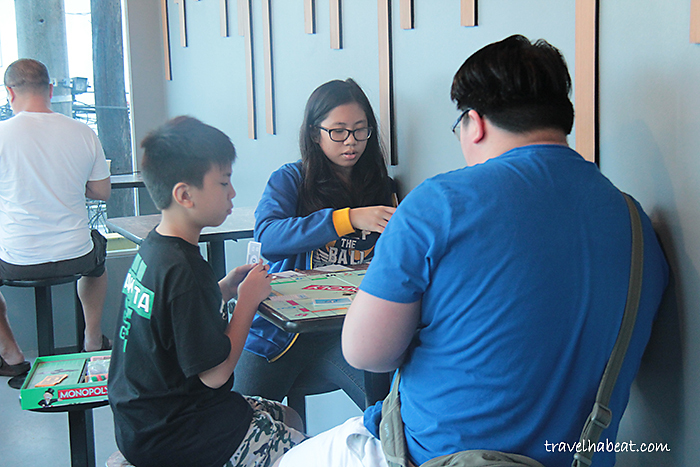 Surprisingly, Garage Café serves sumptuous Chinese food. 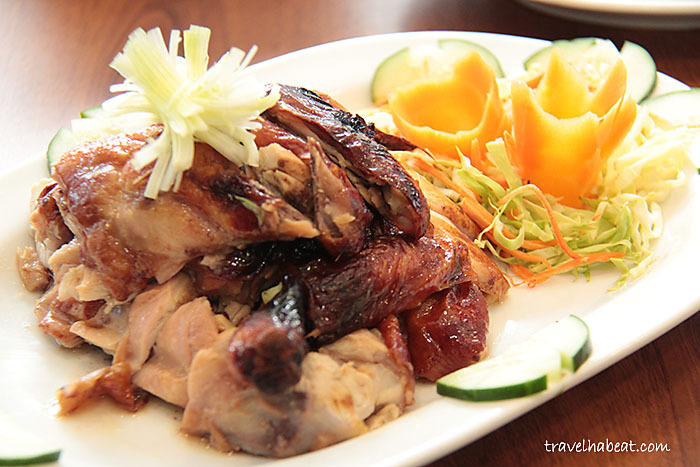 Banawe is famous for its appetizing Chinese restaurants and Garage Café definitely delivers. 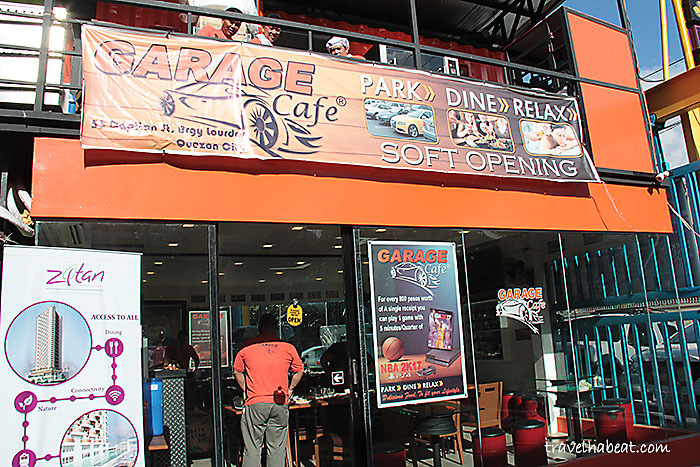 Its name may not hint you of Chinese meals but that garage vibe was very evident in the café’s interiors. I always admire themed diners because of the creativity they attempt to share. 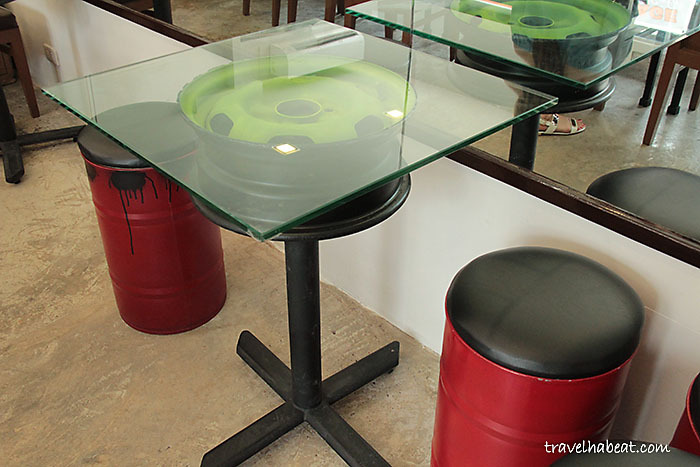 A garage ambiance for a restaurant is not usual that’s why we highly appreciate how Garage Café were able to pull things off – from using car tires for their tables and sink to their wall decor car plates. Everything they served to us was really commendable. 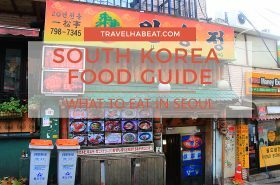 The top three dishes I would recommend are Beef Brisket (PHP300), Roast Chicken (Whole – PHP380, Half – PHP200) and the Hot and Sour soup (PHP150). 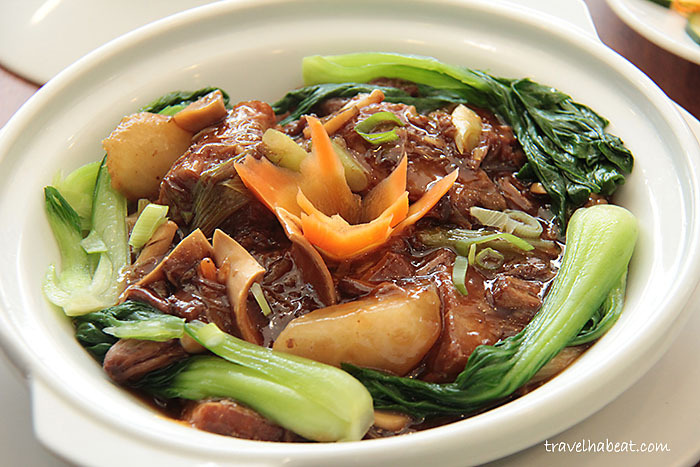 I can’t forget how the Beef Brisket was so tender in that flavorful sauce. 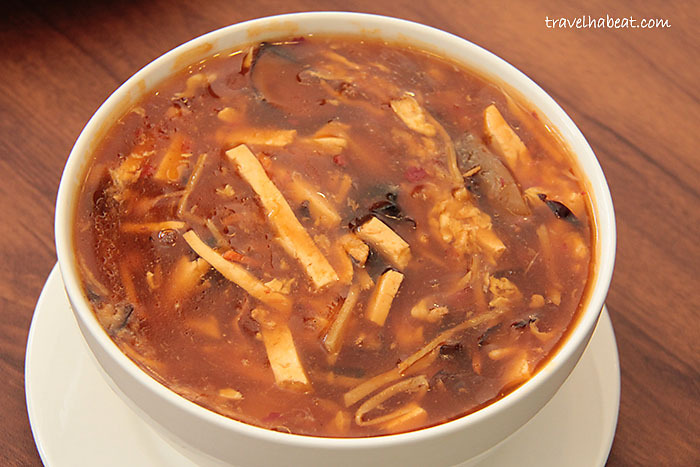 Recently looking for simple tofu dishes, I was glad to discover their Hot and Sour soup containing those strips of tofu. The thick and sour soup was comfort in a cup. 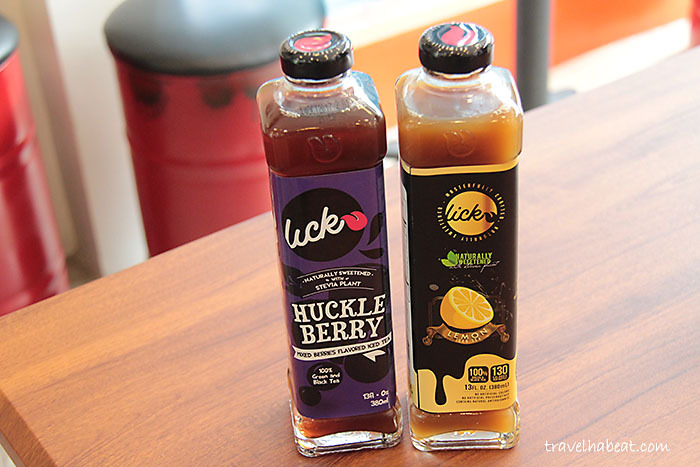 And oh, Garage Café sells a uniquely brewed iced tea, Lick Iced Tea, that was naturally sweetened with Stevia. It comes in two flavors – Huckleberry and Lemon. 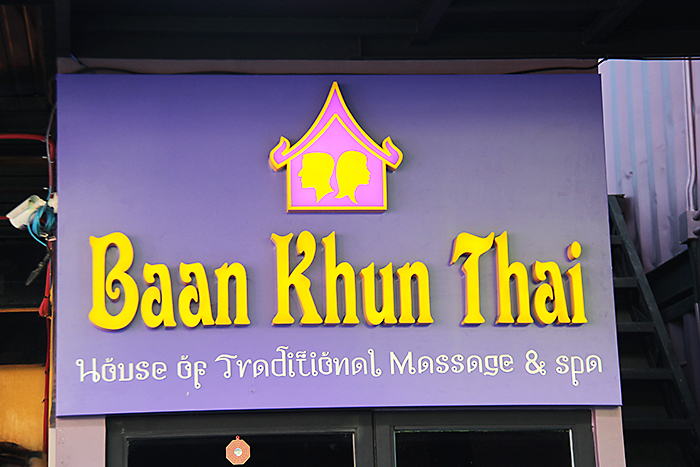 After our delectable Chinese feast, we proceeded to Dapitan 55’s massage haven, Baan Khun Thai. Massage is one of the simple pleasures I spoil myself with. 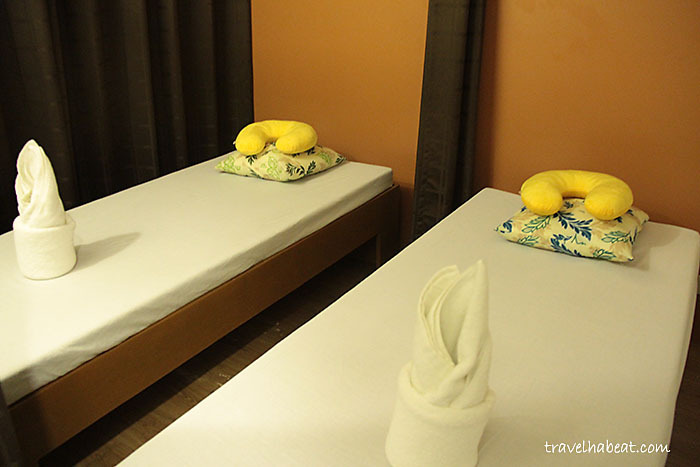 We all availed of their fully body Swedish massage that lasted for an hour (PHP350). We started with a quick foot wash after which we headed in their massage room. Me and my girls were offered mattresses on the floor which can be separated by curtains. Some pillows were provided for guests to use so they can properly breathe. Just across us, we noticed rooms having bed with frames. 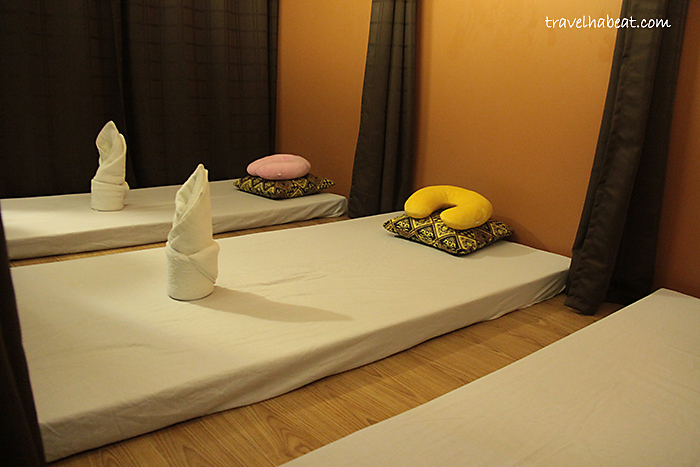 It was my first time to do massage on the floor – it was absolutely fine though I would still prefer a bed with frame because I am more comfortable with my head faced completely down. And the massage? It was fantastic! Therapeutic and relaxing, I asked for a “medium” massage (I don’t find hard relaxing, I feel my bones are crushing, lol) which what the therapist did. From time to time, she was checking out on me and asking me if I was ok. 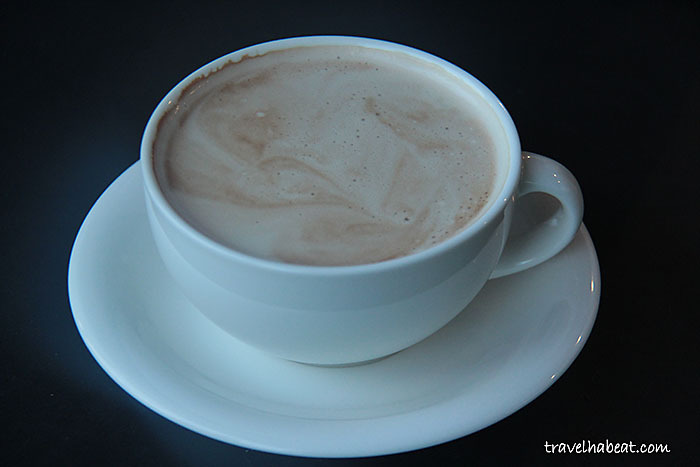 Finally to end our day, we had coffee at BZ Bean. 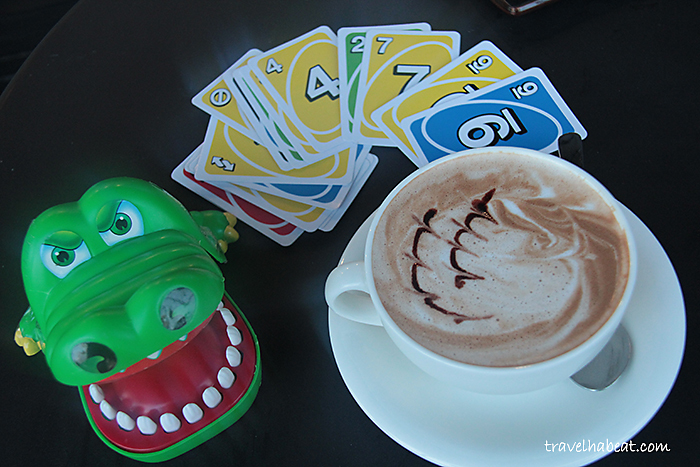 What’s fun about BZ Bean is that they offer different board and card games. 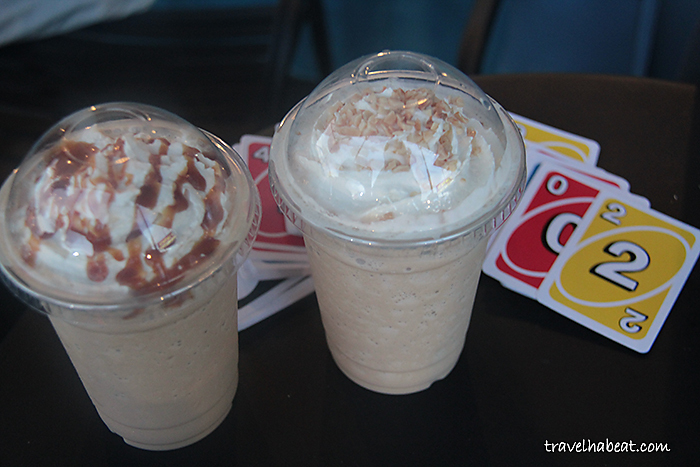 For those who do not want to get bored while waiting for their car wash or fix, having coffee while playing is a cool idea. 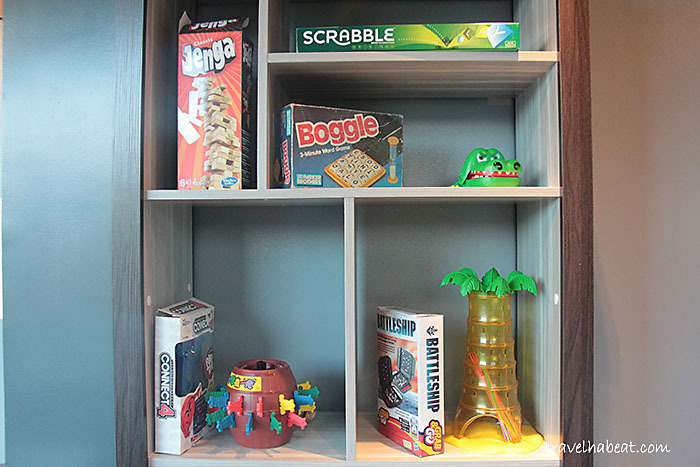 Guests can borrow card and board games while having coffee. We ordered Flat White (PHP120), Cafe Mocha (PHP130), Caramel Iced Blended (PHP160), Hazelnut Iced Blended (PHP160) and slices of Sans Rival cake. Honestly, I didn’t expect much with BZ Bean. But surprisingly, it delivers – quite good if you just have to wait for your vehicle being attended to. Thank you very much to Joyce Esteban, Dapitan 55’s Marketing Manager for having us. 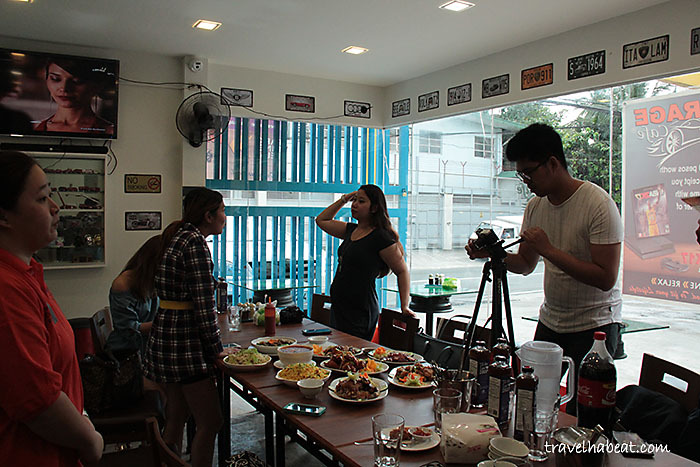 I visited the place with good blogger friends Mich of Dekaphobe, Marge of Coffeehan, and Jerro and Enzo of GourManila. Disclosure: This visit is courtesy of Ms. Joyce Esteban, on behalf of Dapitan 55. 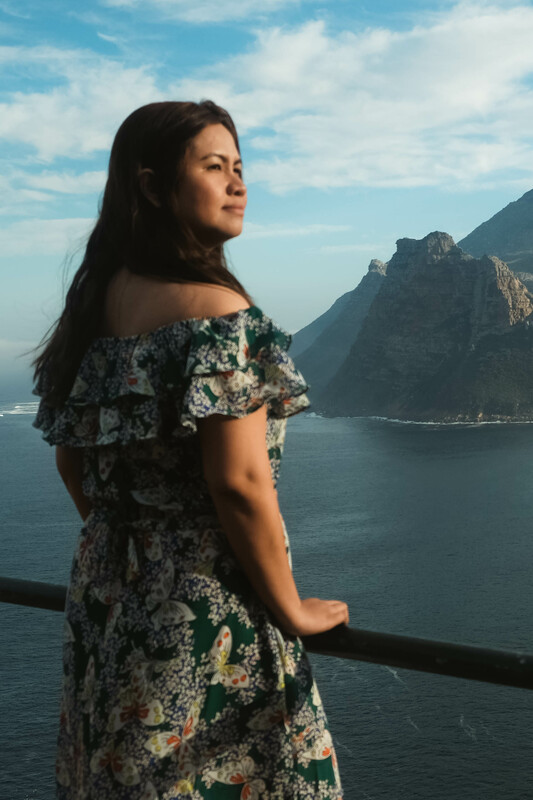 Nevertheless, I wrote this article with my own insights influenced by my personal experience.